Vacuum, Laundry Detergent, Washing Machine, Dryer, Garbage Bags, Sealed Storage Bags/Bins, Duct Tape, Patience! 1) Prior to extermination, remove all bedding from mattresses, gather all linens, and all clothing, etc. from living space. This includes any textile materials that are machine washable - pillows, mattress covers, school bags, anything - and all items that must be dry-cleaned. Even fabric that is in storage should be collected. Wash bedding and all clothing/fabrics in HOT water. and dry in the dryer on hottest setting allowed by garment instructions. 2) After washing, place items in clean, bed bug free storage bins or garbage bags. Seal to prevent bugs from entering and hiding in the clean fabrics. Keep access only to what you will need for a week. All other clothing will remain in storage until your home is determined pest free. 4) Vacuum floors, carpets, nooks and crannies, rugs (if not machine washable), couch and cushions, etc. Vacuum a small amount of baby/talcum powder into the vacuum to prevent any insects from escaping. Place vacuum bag into garbage, double bagged and tied in a garbage bag and discard immediately. 5) Move objects away from perimeter of rooms. For example, if your sofa, dresser or bed is positioned against a wall, pull it away from the wall. The exterminator will need access to the perimeter of the rooms where bugs have been found (bedrooms, living room, den/study). Vacuum along the perimeter of the room if you were unable to before, the exterminator will need access to these spaces. 6) Empty bookshelves, desks, dressers, etc., inspect and place items in storage bins or bags. 7) Remove or cover all fish/reptile tanks. Turn off air to animal tanks. Remove any pet food that is out in the open. Be prepared to remove any animals - cats, dogs, birds, for several hours if a complete residence treatment is proposed. You will need to air out the space prior to returning pets to the treated areas. 8) Install bed bug mattress encasements on all mattresses including box springs and remove beds from rooms being treated. Ask technician how to obtain encasements. The greater your preparation, the more effective the treatment will be. Little to no preparation will result in poor control results. The effectiveness of the treatment will be apparent in the first few days, with longer-term control taking several weeks or more (depending on pre-treatment preparations made and the level of the infestation). Inform Pest Control Operator of any health issues, such as: pregnancy, asthma, reduced lung capacity, etc. It is recommended that small children vacate the premises for a full 24 hours. Do not touch treated areas until completely dry. - Do not throw anything away unless completely sealed in plastic bags. Any upholstered items, couches, or chairs that are infested may need to be thrown out. Let the professional exterminator determine what to save. If throwing furniture out, spray paint to discourage someone from bringing it back into the building. Wrap completely in plastic prior to moving the item out of your home. - Be prepared for follow-up exterminations. Bed bugs are persistent and they don't care how much time and money you spend trying to get rid of them. Two visits are the minimum required, again proper prep will allow for total elimination. You will need to remove all bed linens during your follow up visit. Leave all bug free items in storage bins until the exterminators follow up visits are complete. -Many bed bug infestations are the result of travel - people pick up bugs in hotel and motel rooms and transport them home in their luggage. Visually inspect mattresses before sleeping on them and your luggage before settling in at home after a trip. 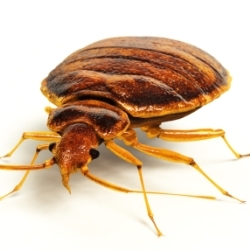 Bed bugs are easier to avoid than get rid of! - Suffering a bedbug infestation does not mean you keep an untidy home or that you live in unfit conditions. They are extremely common and indiscriminate - presence of bed bugs does not reflect your personal hygiene habits or socioeconomic status. Be sure to follow the exterminator's instructions. You cannot be too thorough. Yes, it is annoying and time consuming to prepare for, but it is best to do it right the first time and avoid repeating the process should the extermination treatment appear to fail because the space were not prepared or you brought live bugs back in with your clothing or bags from the cleaners.